The rope is twisted instead of braided like IntelliBraid®. Use for permanent horse, deer and cattle fences. Soft to touch and comfortable to handle. Attach a terminal insulator to end post. Tie end of rope to terminal insulator. Unroll rope along the fence line. 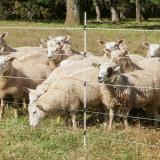 Insert rope in the line posts at the right height(s) for your animals. Attach insulators (preferably notched PI 21n) to corner and end posts. 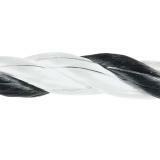 Use one of our reels to rewind and store rope. Install and connect energizer to a ground rod and the fence. Turn on energizer. Check to make sure voltage is over 2000V. 5-strand fence—36", 27", 20", 13", 7"
5-strand fence—50", 40", 30", 20", 10"
3-D fence—inside: 48", 18"; outside: 34"
Use these handy gate handles to enter and exit temporary gate openings. Spring loaded. A quick, easy way to terminate a fence. Secures and insulates the leading end of twine, rope or tape to an existing fence. 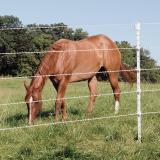 Protects animals from the sharp tops of t-posts and provides an additional energized strand for deterrence. Recommended: 20 out of 21 said they would recommend this product to a friend. Nice for permanent fences. Soft to handle, doesn’t tear up hands like wire. If cut, the ends tend to unravel so be sure to melt the ends as soon as they are cut. 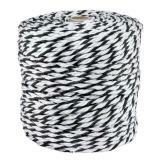 There is a lot of contrast between the black and wire polyester fibers. I think this Endurasoft is the ultimate in rope fencing. It is soft and easy to put up, lasts for years and years (I have some that is 20+ years old and still working great even with trees falling on it from tornado) and I am confident in its visibility. I have a horse who just had eye surgery and one eye has limited vision, yet he seemed to see this rope just fine. I have built many a fence, both permanent and temporary using this rope with little or no help and I am a 62 yo female. Just use the P-springs and you are good to go! Highly recommend! 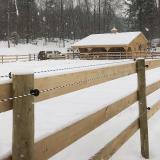 I have used several types of fencing for my 28 horses. Each horse has its own 48x48 drylot. I have found this to be one of the best. 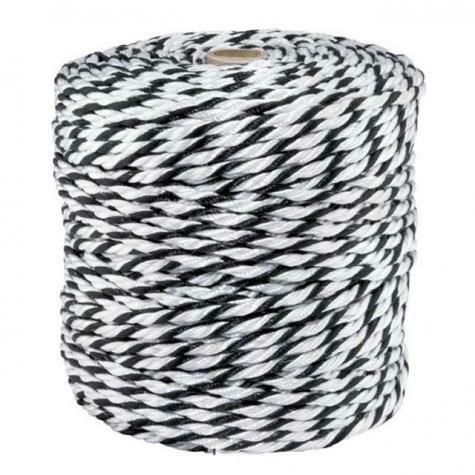 Positives: Quick to install; easy to take down if needed; doesn't get hard scale deposits on it from the weather as I have found the high quality rope has done after just 2 seasons (which had cut my horses leg like wire), has very good conductivity. Soft to the touch. The longest I have had it up is for 4 years in 4 connecting drylots and found it to be very durable. I also have used it for pastures & only needed 2 strands to keep the horses where they need to be. Highly recommend. I have been using Endura Soft for many years. It has held up well to the punishing Arizona sun. The horses see it easily, it is excellent at transmitting current, and if the horses do hit it, it doesn't hurt them the way wire fencing does. It is very easy to work with, you just need a good sharp scissors to cut it, it doesn't tear up the hands, and a woman can easily work with it without needing a man to pull it taunt. The roll I recently bought is for my neighbor that has horses and asked me to order it for him. He's a cowboy, but he is very impressed by the product after seeing how well it works for my horses, and wants to use it for his own horses. I didn't need to buy it to replace fencing I put up, it is holding up excellently for 15 years now. 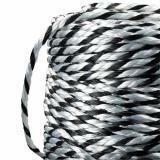 By far the best of the rope products. Very soft and easy to work with. Doesn't fray or break. We use it on our permanent fences for horses. Easy for the horses to see, soft in your hands when installing, has lasted 11 years now. Conducts electricity well, and we have sandy soil. Our wide tape has outlived its lifetime so we're replacing it with more Endura Soft rope. It's easy to work with.